Well all the holiday festivities are over and we are all settling down into the long winter, so I thought....hey......let's have a giveaway!! Now is the time to have your house decorated in a winter theme and what better winter décor than.....snowmen!! 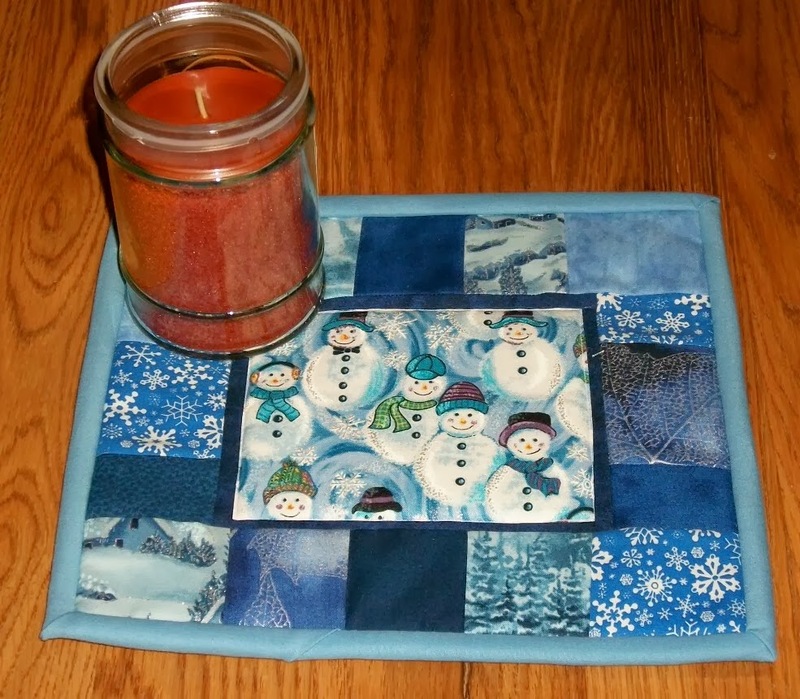 So....I am going to giveaway this candle mat/mug rug with cute little snowmen in the middle, snowflakes on the sides and some winter scene fabrics. Be a follower of my blog and leave a comment on this post. New followers are always welcome. Leave a way for me to contact you if you are a no-reply blog or do not have a blog. Good luck to all and thanks for all your continued support of my blog. What a lovely thought. You're right! I tend to pack all the Christmas decorations away and the house is so bland. This mini quilt would liven up anyone's space (hoping it'll be my space) for the remainder of winter. Hi Colleen, I love snowmen. I have quite a collection of snowmen but haven't put out very many of them this year. I would love to have a snowman mug rug. I follow you with email. Most certainly sign me up for your giveaway! You know me and sewing!?! I am a follower--I think every where! Have shared on my blog and the OFG team blog! Thanks for the fun winter giveaway! Great giveaway! Following you on blog lovin. Very cute! I love all the blue. I follow you on bloglovin. Thanks for the giveaway! What a cute little snowman! I am a follower of your blog. 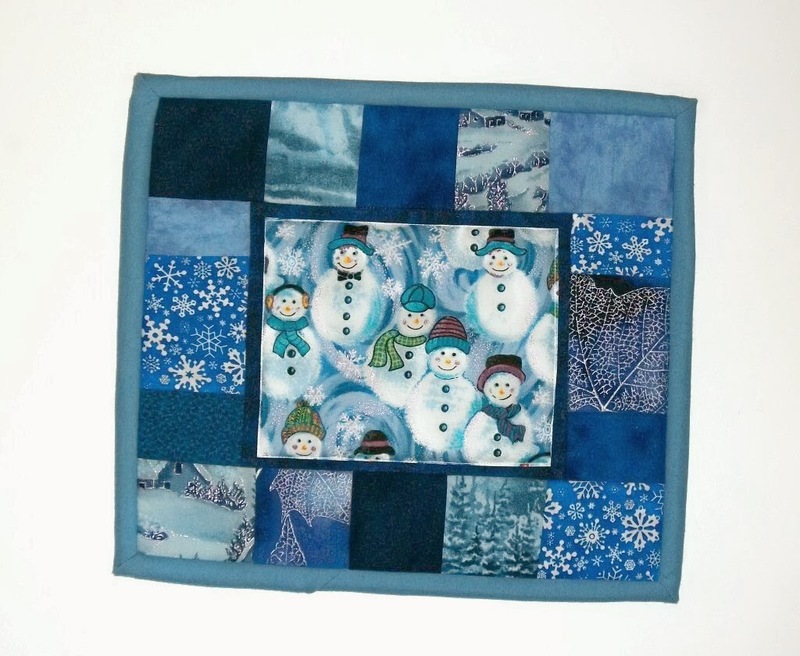 I am a new follower of your blog, Colleen, and I just love your snowman mug rug! So cute! Thank you so much for hosting this giveaway! Those snowmen are certain to put a smile on face! Great to cheer up the winter doldrums. I follow with Bloglovin' but I get so many updates that I never have time to read through them all, so I signed up to get email alerts, too. That way I can stay on top of your posts! Happy January! I follow on bloglovin. When Christmas goes away, my snowmen come out to play!! Thank you for the wintery giveaway! I found your blog from Barb's Heartstrokes and now I follow too! I put your giveaway on my sidebar. What a Beautiful candle mat. Snowmen are my favorite. I will post your giveaway on my sidebar.